Wembley is stored in the memory bank as one of the toughest shows we have worked on. It wasn’t just that we fired the Rugby World Cup two weeks earlier, or the fact that we only had 20 days from start to finish to deliver this event, the installation was incredibly tough as well. The roof at Wembley Stadium is a very difficult place to work with everything requiring the one commodity we didn’t have – time. We were informed that the Indian Prime Minister, Narendra Modi was making an historic visit to the UK and that Wembley would host his welcome along with David Cameron and 75,000 people from various communities across the country. The date of the event was Friday 13th November, which coincided with Diwali and the finale was being billed as “the country’s biggest firework display”. The problem was that this statement had already been put in the public domain in a press release long before anyone had discussed what was safe and what the budget could secure. 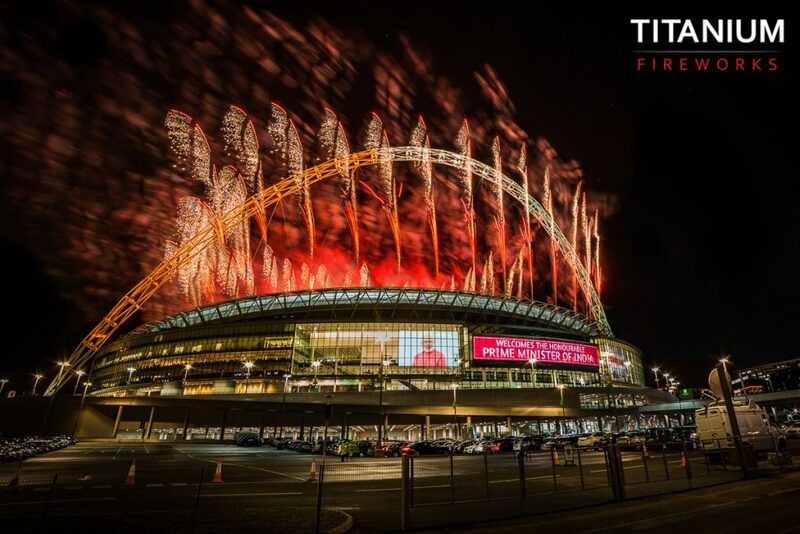 One of the greatest challenges we had was that Wembley and Brent Council were very nervous about licensing such a large scale event. 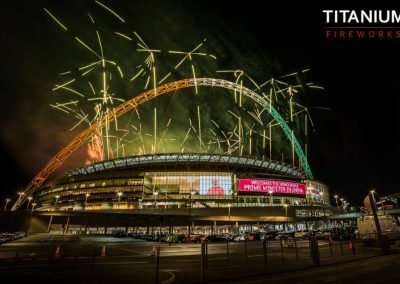 We were told by the venue that a conscious decision had been made to resist all pyro fired from the roof since 2011 and that we were the first company to fire a large scale event like this from the roof of Wembley Stadium. 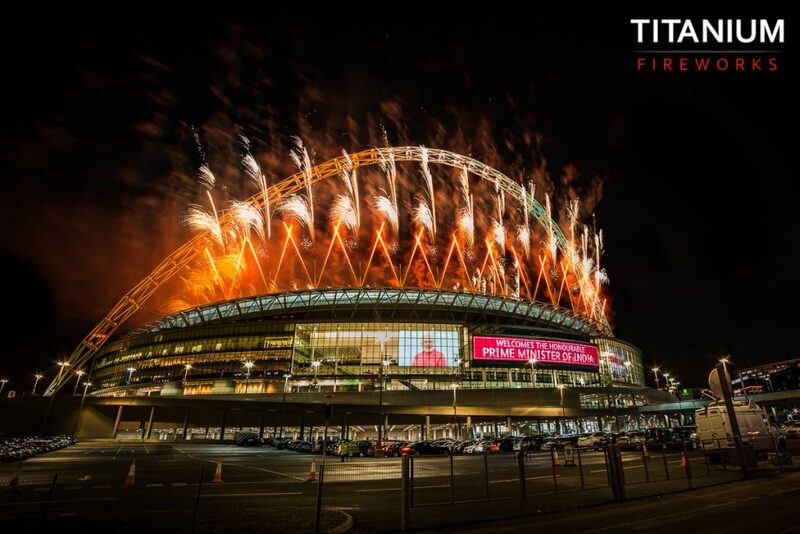 We obviously had to live up to our reputation and ensure that we delivered a safe display with minimal impact to the roof or the stadium whilst meeting the expectations of the client and audience. The final brief was to provide a pyro musical sequence of 60 seconds with 30 seconds of flames on the field of play. We started the install on Tuesday 10th November with a crew of 8 technicians who were experienced with working at height. The roof is made of a corrugated clad covering which when wet was notoriously slippery, with the spines of the corrugation was just under the length of one foot. In order to get around you either had to walk like Charlie Chaplin with your feet turned out or walk sideways side stepping or walking on the peak of the corrugation which was very narrow. By the end of the first day our legs were burning with the roof Workout! Because we were short of time Mother Nature of course decided to throw herself into the mix with gale-force winds and torrential rain. However, in the end the show delivered in spectacular style and we exceeded the brief. Stadium shows are in their nature unique, with a different set of technical problems at every venue. Although at the time Wembley was far from enjoyable, we have some terrific images. 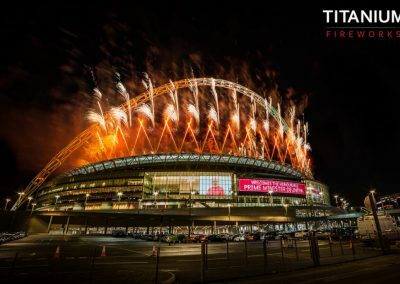 Thanks should go to Cris Mathews of Pyro Productions for his amazing work in delivering some of the images and videos we have of both RWC and Wembley. Our biggest thanks of course goes to our team. Delivering any large scale event requires strength and depth throughout as well as team work, commitment and experience. 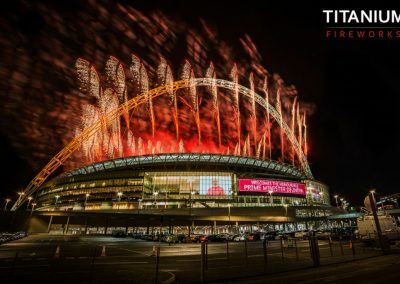 We are blessed at Titanium with the quality and commitment of our crews, whether they be tramping around fields in the rain or harnessed to a stadium roof hurricane winds and driving rain.